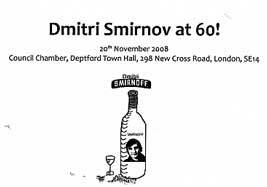 A pleasant evening for Dmitri Smirnov was organised by the Russian Department of Goldsmith's College. In pre-concert discussion the different atmosphere for composers in Soviet times and Russia now was explored, as well as the position of ex-patriate composers settled in UK. There was a large audience gathered to hear Smirnov's tribute to Denisov for cello and musical glasses (Alexander Ivashkin) followed by three of his piano sonatas (Alissa Firsova). Finally Philippa Mo, with Goldsmiths Strings, played Smirnov's first Violin Concerto. All the music was intensely expressive, indeed romantic in effect; far from the more theoretical avant-gardism to be heard at e.g. the Warehouse Cutting Edge concerts. 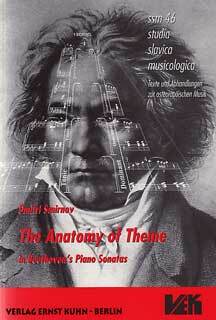 The occasion also served to bring to the Goldsmiths' College audience's notice Smirnov's latest book as musicologist. 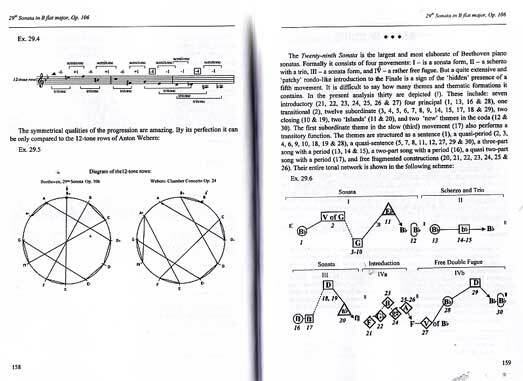 Published upon his 60th birthday, his book about Herschkowitz and Beethoven A Geometer of Sound Crystals has been followed with a more detailed examination of Beethoven's Piano Sonatas "The Anatomy of Theme" [VEK ssm 46]. This new book (in English) is produced with lavish illustrations on nearly every page, and its analysis of each sonata (from the seven early sonat(in)as through to Op 111) will bring a new dimension to the study of this core cycle of masterworks in the history of music. The interesting question it raises is how much such detailed bar-by-bar analyses might have a bearing on interpretations of the sonatas by pianists and their understanding by listeners, and indeed by concert reviewers. No question that it has been a massive task, brought to completion with generous cooperation from the publishers. It is a beautifully produced and enticing book. Musical Pointers would welcome an expert appraisal. Review by Hamish Gallie MMus (Alumni Goldsmiths’ College) provided by the composer: The audience more or less filled two thirds of the Duke's Hall and we were all personally greeted by the composer. The programme began more or less on time at p.m. and was supported by a neat and very concise, interesting and multi-lingual programme in English, Japanese and Russian. Japanese was the theme of the evening as Dmitri had set to music in 2003-4 17 Haiku (3 line poems consisting of 5, 7 and then 5 syllables) by the very famous Japanese poet Matsuo Bash? (1644-1694). In general the attempt to set these poems to music was a valuable exercise in following the flow and rhythm of an ancient, foreign and sophisticated art form. Each piece was a careful crafting of light instrumental and vocal forces around each individual short haiku. Each haiku possessed a different mood and character. Miniature portraits of The Frog (Part I, I) contrasted with a general tendency towards reflection on partings and death. Each haiku setting was a 'tight compression' of musical as well as verbal Ideas. In a kind of Russian and Japanese way laconicism was rife. It was inspiring to witness this kind of partnership working between a Japanese lyricist and a contemporary Russian composer. I was wondering if the composer had done the translations himself from Japanese to English. What did strike me was that Dmitri's artistry remained in a prominent position and helped the lyrics speak in a more vivid and meaningful way albeit to our Western ears. I wonder what Japanese people listening thought of this work. Dmitri's use of tone and texture was measured very carefully; the ensemble of flute, clarinet, violin, cello and piano had only three tutti’s in the whole forty minute or so performance. The textures and effects were spaced clearly and it seemed the players were totally at ease. The playing looked well rehearsed and slick. The players were constantly referring to each-other and there was not one doubt of their intention or purpose. The writer enjoyed the playing of all the players for different reasons. Alissa Firsova for her constant devotion to her father’s work and deepest understanding of his methods and style, Erika Colon for her beautiful poise, technique, Japanese aesthetic and kimono, Lucy Downer for her supported and calm approach, Tzu Kao for her skilled playing of difficult passage work and careful expression, Jessica Hayes for her strength of playing and skill in fast passages and Lisa Ueda for her brilliant intonation and ensemble presence. The rhythmic interplay of the cello and violin sometimes at high speed was what gave the pieces some sense of drama. In contrast solo passages of flute and clarinet added to the sense of calm and reflection. The angular style of the melodic instruments and quite rapidly contrasting dynamics did not disturb the place of Bash?’s poetry. The incredible use of silence and space was one of the best weapons of this work. It was good to hear enough silence which is such an important tool in Japanese poetry and music. Dmitri's purpose was definitely not to emulate Japanese musical idioms, instrumentation etc. Instead and thankfully we heard the composer’s voice. Op. 140 is another exciting work from this elaborate composer who has demonstrated great skill in executing and delivering such well thought out multicultural work. This concert marked the 60th birthday (give or take a few months) of the composer and it was a great honour to share this moment in music. A special note of congratulations must be made to the conductor Ian Anderson who agreed at the very last moment to conduct the haikus.